It’s been cherry-palooza around here. I’ve dried, frozen, canned in lime-almond syrup (fabulous, by the way), given away and eaten (and eaten and eaten and eaten) fresh cherries by the pound. We’ve even got my 2 year old saying “cherries make ya poop a lot!” which seems far more adorable when it’s coming out of a grinning toddler mouth than it does now that I’ve written it in black-and-white, actually. 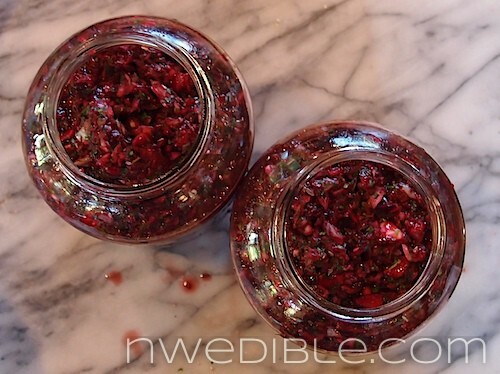 The cherry preserve I am most excited about is this Lacto-fermented Cherry Salsa. 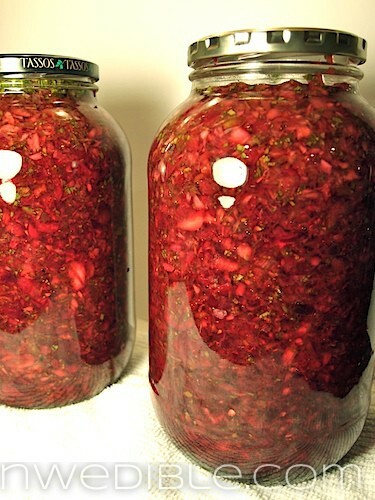 Most of you know that I am a big fan of fermenting foods, and I’m a huge fan of salsas. The two things are made for each other. Salsas tend to lose a something in texture and taste when you cook them, as you must if you want to preserve them by canning. Lacto-fermenting is a preservation technique that keeps that fresh taste alive for months and months. Last year’s LF tomato salsa lasted in very good condition, refrigerated, until about April when I used up the last jar. So, when I was brainstorming ways to use the 55 pounds of cherries I got hold of, a LF cherry salsa topped the list of New Things To Attempt. Now that I’ve made it, I think this one’s going to be a ZOMG Where’ve You Been All My Life winner. Down the road I image pairing this salsa with pork, chicken, prawns or salmon when I need a simple way to dress up a meal in a hurry. And an honorable corn chip would feel no shame in wearing this salsa either, me’thinks. Chop everything in a food processor. Seriously. You don’t have all day. Feel free to halve or quarter the recipe. This makes quite a lot. To make this full batch of salsa, you will need about 1 cup whey and about 1/3 cup salt. Mix all ingredients except salt and whey until well combined. Taste your salsa. If you want to play with the ingredients, feel free. All more cilantro or more sugar as it suits you. Remember you’ll be adding salt later. If you want to eat this as a fresh (not fermented salsa) season to taste with salt and call yourself done. Store salsa in the fridge and eat within a few days. If you want to preserve this salsa for eating later, put salsa in spotlessly clean jars with well fitting lids. The volume of the jars does not matter – you can put your salsa into pint jars or quart jars or old olive jars, as I did here. Fill jars 1 cup at a time, keeping track of how many cups of salsa you put into a jar. 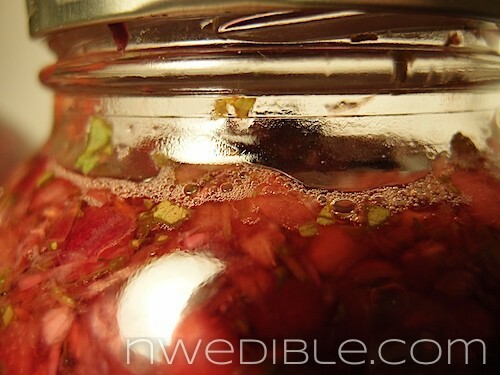 Leave at least 1-inch of headspace in the jar (more headspace for larger amounts of salsa). For each cup of salsa, add the following to your jar: 1 tablespoon strained whey and 1 teaspoon kosher salt. Stir the whey and salt into the salsa and, using a clean spoon, taste the salsa. It should taste just a hair to the salty side of very good. If the salsa doesn’t have a pleasantly briny salt level, add a bit more salt. As the salsa ferments, a bit of that saltiness will mellow out, but don’t go too crazy. 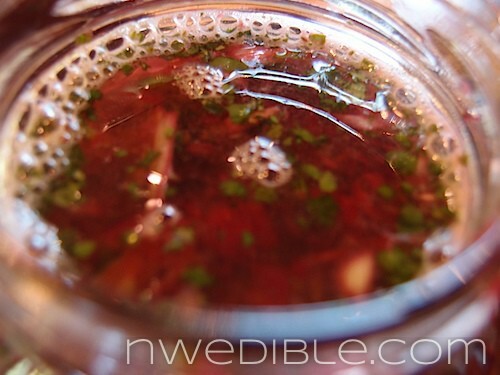 This salsa didn’t make enough natural brine to fully submerge the cherries and veggies. It’s important that the salsa be covered by liquid to protect it from nasty molds and other ickiness. Top the salsa with an inch or so of water to cover. Try to keep all the chunky stuff under the water. Cover jars but don’t make the lids super tight. Excess pressure needs to be able to escape. Leave covered jars at room temperature for 1-5 days (see edit below), depending on your room’s temperature and how much fermentation you like. After 12-24 hours you should start to see small bubbles on the surface, a sign that fermentation has started. Edit 8/1: having enjoyed this salsa for a week I would now say to err on the side of very lightly fermented. Ferment 12-48 hours, and only towards the higher end if you are fermenting in a cool spot. Fruit ferments take off fast. When it is at a stage that tastes good and the salt has mellowed, refrigerate right away. Don’t “give it another 12 hours,” just trust your instincts. It will continue to evolve in the fridge. My salsa is still excellent, but with a 48 hour ferment it went about 12 hours longer than I would have wished, in retrospect, and has gotten a tad pickly in the fridge. Use a clean spoon and taste the salsa every day. 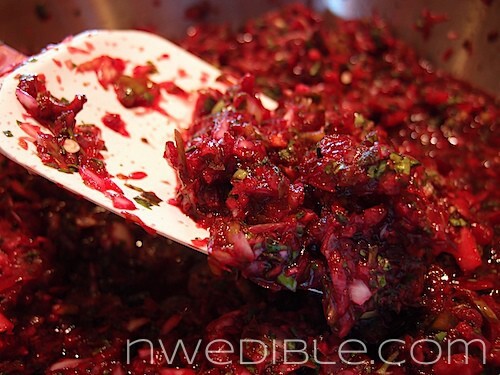 While you are at it, push the salsa under the brine level (clean spoon!) and re-lid the ferment asap. When the salsa is completely fantastic, it’s done. Put it in the fridge and enjoy it for (what I would I anticipate to be) months. This sounds wonderful. I don’t have cherries, but I may use this recipe as a jumping-off point for a “ground cherry” salsa. Ground cherries are more like sweet tomatillos than cherries, but I think it will work. Thanks for sharing! That is a great idea for ground cherries! Not need to pit just peel off the husk and chop. Not sure I will get enough ground cherries this year (I have a grazing toddler who eats everything) but maybe next year I will remember to plant a few extra plants. 55 pound of cherries…you are so lucky. Our state cherry crop here was pretty much wiped out by the weather. I heard one report saying that instead of 10 million pounds of cherries expected there would maybe be about 1/2 million pounds. I would say our Door County sour cherries are the best in the country (my opinion as I have had no others). I have one quart freezer bag left from last years crop so that will be one last delicious pie this summer. This lacto-fermentation always sounds so strange to me. But is it pretty much how my grandmother used to make sauerkraut and pickles? In the crock? I have her crock and her box of recipes, mostly undecipherable. How do you and Homebrew husband work out how to separate your lactofermenting veggies with his fermenting wort? Lactobacteria can destroy a beer in short order and I’ve been paranoid about potential cross contamination. Good question. So far, so good. I will say Homebrew Husband is Mr. Sanitation when it comes to his beer. Airlocks, always, on everything unless he’s racking. And due to timing with kid-wrangling and kitchen space more than anything else we tend not to do our fermenting projects on the same day. But honestly, beyond that we haven’t taken any measures to prevent contamination and it’s never been an issue. The only transfer of microbes I’ve noticed is that wild bread sourdough starters that I manage to catch always taste vaguely beer-y. Because of this I suspect our dominant native yeast population is straight out of a homebrew smack-pack. Just whey that comes off yogurt or kefir when you strain it to thicken it. No curdy chunks. 🙂 And not whey from cheesemaking b/c that’s usually heated about 120 so the beneficials will be killed off. For a micro batch, go with “to taste” on pretty much everything, especially the jalapeno. Spice doesn’t always scale well. But with LF preserves, unlike canning, you can mess around with “low acid” foods. 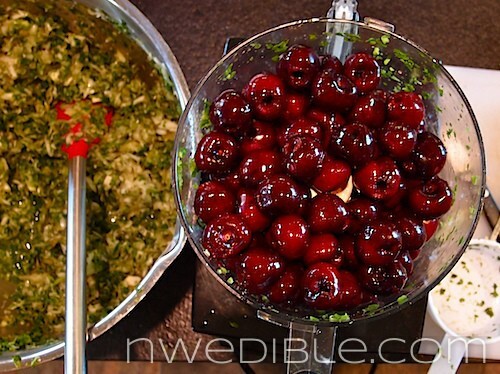 I’d just get however many cherries you have chopped and then throw everything else in until it’s yummy. Thank you!!! I will let you know how it turns out! Hot damn this sounds good. We’re done with cherries in Colorado but rolling in apricots and I shall try this with apricots very soon. Thanks. Lime almond syrup – could you please post a recipe? I did some with a bit of almond extract. Did you add the lime for an acid or just for flavor? 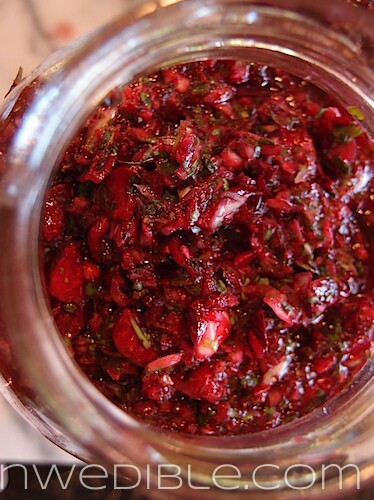 I lacto-fermented cherries too – they would be even better as salsa, next year! I love the idea of doing this with apricots, too. Wow, this looks awesome (not cherry time here though, sadly). I am just hopping onto the lacto-fermention bandwagon. You always have to keep it in the fridge though right? There’s no way lacto-fermented goods can be kept on the pantry shelf? I haven’t tried L-F yet, but this sounds really delicious. How do you keep it tasting “completely fantastic”? Does the salsa stop fermenting on its own? Or does the taste change between now and April, when the last jar’s opened? How’d you pit the cherries? I grew up around cherry trees and scoured flea markets to acquire an old cherry pitter clamp that looks like a meat grinder. I’ve never seen one in cooking catalogs, but I recommend it–much faster than the punch kind. Thanks for the interesting recipe. We aren’t able to use whey–would extra salt work here? When you say whey from yogurt, is that homemade or store bought yogurt? Can I take my tub of nf Greek goodness from Costco, drain out the whey, and use it here? Sounds delicious. Maybe I’ll start buying yogurt again. I can’t tolerate it very well, but one of my gobins loves plain (the sourer the better) with fresh fruit. I can strain the whey off then. Also, I wonder if something like 1/2 sweet and 1/2 sour cherries would make a nice balance if you wanted to serve this fresh instead of fermenting. Washington cherries have been “on sale” recently, but at $3.50/lb, seems pretty damn steep to me, then again cherries aren’t something I typically buy. Maybe later in the season I’ll try and grab some. Holy hell this stuff is kind of my favorite thing ever right now! Why can’t cherries be a thing here?! After $9/lb they were $4 so I snatched some up for this. Honestly, I was way into doing salsa and salsa verde and thought, why not? So glad I did it because it is amazing. Absolutely becoming a tradition here 🙂 I used some strawberry/lemon/mint kombucha that’d been put up for some time and, just wow. Spot on. What if you can’t do dairy and want to skip the whey? Do you suggest doubling the salt as with other vegetable ferments? I am starting this today. I am a bit nervous about it, until now I have only attempted to ferment cabbage and that always ended in a disaster… But I have a huge cherry tree and tons and tons of cherries, so I am willing to try something new.